Join us in the fight to put an end to Lupus with this Personalized Lupus Awareness T-Shirt. Lupus Awareness T-Shirts show you are helping support those battling with this condition and gives hope to all Lupus warriors and their families throughout the world. Our Personalized Lupus Awareness T-Shirt is available on our premium 100% cotton T-Shirts, machine washable in youth sizes XS-L and adult sizes S-3XL. Includes FREE Personalization! 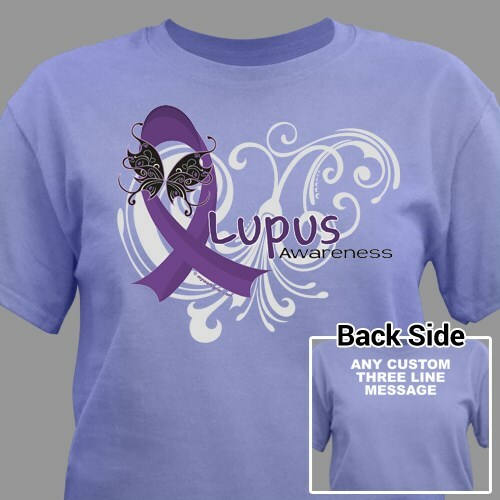 Personalize your Lupus Awareness Shirt with any three line custom message on the back. T-shirt was as it was pictured. Very satisfied. I will be doing future business here. Additional Info At MyWalkGear.com, we are dedicated to promoting awareness of Lupus and other diseases. We encourage others to get involved in the fight for a cure with our Lupus Awareness Walk Shirts and Gear. Help us help those who need us the most with our inspiring Awareness T-Shirt along with our Lupus Awareness Long Sleeve Shirt and our Lupus Awareness Key Chain. Feel great knowing a portion of your purchase will be donated to end Lupus once and for all.